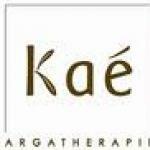 Kae (formerly Kaeline) is an argan oil based range of skincare and hair care products, certified organic by ECOCERT. Argan oil has exceptional anti-ageing and protective skin properties. The flagship product of the Kaé range is Huile de Beauté, the purest form of Argan oil (100% organic argan oil), suitable for face, body and hair. Kae products are packaged in beautiful glass dispensers and Kae Argatherapy, combining the properties of argan oil with the properties of essential oils, offers the most indulgent way to care for your skin and hair.